On a private Facebook thread, where a friend expressed dismay at Trump leaving the Paris Climate Accords, a smug skeptic dropped in a dataviz that argued against the effects of combatting climate change. This struck a nerve in me. Data visualizations are a tool, and can be used for good or evil. Because they are visual, they can have a more immediate and visceral impact than mere statements, in part because of the Picture Superiority Effect. So, I responded, in a thread that quickly grew too long. My new opponent, who I cleverly detected as having a libertarian bent by glancing at their last couple public Facebook posts, used many of the classic tropes for Internet trolls arguments, though stopping well short of the Hitler-Nazi threshold. They used blunted accusations of logical fallacies, while engaging in fallacies themselves. 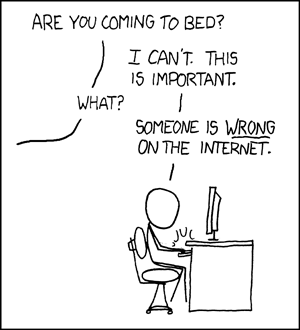 I probably shouldn’t have engaged, but I felt compelled: they were WRONG on the INTERNET! They used the facile quasi-reason that is such an insidious force on public dialog, and they misused a dataviz. I could not, as the kids say, even. Some Sensible Stranger: It was a step in the right direction! ALT: No, it wasn’t. It was a waste of the money we will need to help people cope with a changing climate. 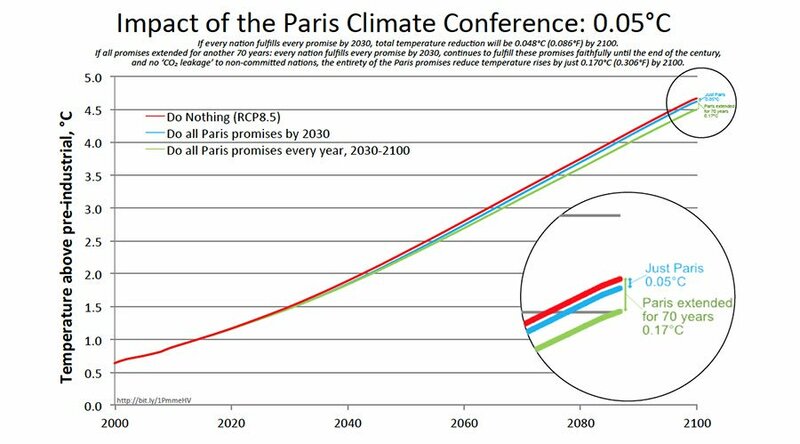 ALT: The practical reality is that the goals set by the Paris Climate Conference are akin to the Kyoto goals: small enough not to bankrupt the entire world, and small enough to not actually do a darned thing to reduce CO2 emissions. Put it this way: the US, using the free market, has done more to reduce CO2 emissions than any agreement or accord or treaty we’ve signed or not signed. Me: There are a number of problems with that dataviz, not least of which is that it’s unsourced. Where did those projections come from? What are the margins of error, and what are the variables? Who made the projection? What is their goal in making the dataviz? What is the impact of their 0.17ºC change? Even assuming that the dataviz is correct, which is a leap of faith, you assert that it’s wasted money, and that it wasn’t a step in the right direction (e.g. that it doesn’t lay the groundwork for future, stricter agreements). What’s your basis for those assertions? Where specifically could the money be spent more effectively, and are you assuming that those resources (as expressed financially) are indeed fungible and have the same sources of control? In short, this seems to be mere opinion, of a similar vein to the trendy nihilist distraction that paralyzes rather than effects change. ALT: Unsourced? Or are you simply wishing it were unsourced? Me: I stand corrected. What I took for the URL for the picture itself (the bit.ly URL in the bottom-right corner) was in fact the source. (I’d argue that’s bad provenance hygiene, since it’s a fragile link with no supporting text or search terms, but at least there is a source quoted). In fact, the source is Bjørn Lomborg, who’s well known as a climate change skeptic. He’s clever because he doesn’t deny that climate change is happening, nor that it’s caused by human activity, but only argues that it’s too little and too late to do anything about it. The article cited in the dataviz is “Impact of Current Climate Proposals”, and it feeds his line that we should spend the money elsewhere, such as AIDS, malaria, and malnutrition; again, the assumption is that the necessary resources are fungible. His assumptions and projections in that article are refuted (Ward) , as are most of his arguments, but the majority of climate scientists. His methodology is convenient for libertarians and for corporations, governments, and organizations that wish to halt or stall efforts to rein in climate change and apply “free market” solutions, but is counter to the overwhelming consensus. ALT: You’re actually correct. Because of climate hysteria, people are willing to spend trillions of dollars to suppress plant food, but without that unreasoning hysteria, people are unwilling to spend money on Clean Water for Everyone (for example). Maybe we should stop with the hysteria? The IPCC predicts a 2 degree C warming, but we’ve already seen 1.4 with no apparent harm to the world. The IPCC says that the harm from climate change will be less than many other harms felt by humans, including war, poverty, pestilence, drought, and famine. I’m not a climate scientist. I have to rely on what the IPCC says. How ’bout you? Where did you get your degree in Climate Science from? Ward says “Neither of these scenarios corresponds to expected policies beyond 2030.” If that’s not hand-waving, I’m a monkey’s uncle. The fact is that CO2 emissions have been growing. You cannot assume that a subsequent agreement will be signed, nor can you assume that, counter to all evidence, people will voluntarily impoverish themselves by ceasing to use fossil fuels. May I add that impugning the source of information has little or no value in a discussion of the value of the information. Such a reference is ad-hominem. Similarly, imputing veracity to a document merely because the source is well-known is an appeal to authority, similarly a fallacy. Can we possibly not resort *immediately* to fallacies? It would be better to wait until after you’ve failed to convince me, which you surely will do. I’ve looked at the evidence, and you don’t have any that will convince me. Me: The strawman of your first paragraph is simple sarcasm, and meaningless. You really don’t seem to get the fungibility issue. The money “spent” or “saved” on climate action is not the same resource that would be “spent” or “saved” by completely different actions toward eradicating disease or providing abundant food or water. Of course, climate change is making it increasingly hard to get clean water around the world, but you live in the US, so it doesn’t affect you yet, so I’ll move on. “No apparent harm to the world”? Nonsense. Educate yourself about the effects of climate change. Information is abundant. Yes, I used an ad hominem argument. I did so deliberately, and with good reason. The source of the information you cited, Lomborg, is subject to the same scrutiny that anyone in the scientific community is; that’s how science works. Lomborg has been refuted again and again, so his arguments should carry less weight than those by scientists who have better reputations. Nor did I cite any particular document or author as “well-known”, I just posted a specific refutation of Lomberg’s paper that you cited. I wasn’t appealing to authority for a particular author (well-known or not), but rather showing an example of the kinds of criticism leveled against Lomberg by the climate science community at large. So, I wasn’t using an appeal to authority, I was reinforcing How Science Works, which is by repeatability and consensus opinion. BUT! If I had been appealing to authority, citing some specific and well-known climate change expert, that too would not have been a fallacy. You keep conflating “types of arguments” with “types of fallacies”. Many formal arguments have both valid and invalid forms. Saying “X is a climate scientist; X says Y about climate science; therefore Y is more likely to be true” is a valid form of appealing to authority; in fact, you used it yourself when image-bombing that dataviz into this thread, and had your source been more reliable, it would have been a persuasive, strong, and valid argument by authority. An invalid appeal to authority might be, “X is a medical doctor; X says Y about climate science; therefore Y is more likely to be true”, which neither of us made. A good example of a fallacy that doesn’t have a valid argument form is cherry picking, which is “the act of pointing to individual cases or data that seem to confirm a particular position, while ignoring a significant portion of related cases or data that may contradict that position”. For example, selecting a single author who holds a controversial and widely-refuted position, out of a field of many researchers on that same topic who hold contrary views, in order to make or reinforce a claim or viewpoint, would be cherry picking. It would be like if you picked the one well-known climate change skeptic that validates some libertarian “free market” philosophical solution to addressing climate change, and ignoring the 95+% of climate change scientists who agree that climate change is real, that it’s caused by humans, and that we can take active steps to decrease its negative effects. But neither you nor I would cherry-pick like that, because it would harm our credibility, and we know that since neither of us is a climate scientist, we should trust the scientific consensus by climate scientists rather than applying our own inadequate filter to select a fringe view. We’re both rational people who realize that the stakes are too high to indulge our default reactions and worldviews on topics we’re not qualified to advise others on. That would be the appeal to the common man, a logical fallacy akin to the appeal to authority, which holds that everyone’s opinion is equally valid in all matters… and we all know that that’s just silly. Of course I realize that I won’t and can’t convince you. That’s not my goal. It’s clear from the style and substance of your arguments that your confirmation bias has a firm grip on your ability to process information. My goal is to present clear refutations of your claims, so that such toxic ideas have a decreased change of taking root in other people who might otherwise think your rational-sounding position is based in anything pragmatic. It’s probably too late for you. I don’t think it’s too late for the planet. I’m satisfied that I’ve accomplished my goal, so I’ll leave you the last words in this discussion. Surprisingly, they haven’t posted since. I’ll keep you updated if they do. Naturally, ALT didn’t post a response. What response could they have posted? But on a thread about this blog post, another libertarian men’s rights cultist took exception to this post, saying it wasn’t a takedown. Why? Because I hadn’t refuted the climate claims, or the figures, but only the underlying logic and credibility of ALT’s argument. Of course, that’s another classic argument tactic: attempt to force the opponent to argue on your terms, not the aspects on which you’re weakest. Because, by doing so, you are granted that your weakest methodology is axiomatic, and you can quibble on details. ALT was fundamentally wrong, their reason fundamentally unsound. I didn’t even need to get into the actual details of climate change or its remediation. And since neither of us were climate scientists, any debate would have been as meaningful as bickering over the number of angels that can dance on the point of a pin. I didn’t need to argue whether climate change is real, nor whether remediation is worthwhile, because experts have already established those facts, exhaustively… read the climate change experts if you want that takedown. What I needed to challenge was how my opponent was gathering, processing, and presenting the facts, and to prove them wrong in all three of those aspects.